I know correlation does not imply causation but instead the strength and direction of the relationship. Does simple linear regression imply causation? Or is an inferential (t-test, etc.) statistical test required for that? The quick answer is, no. You can easily come up with non-related data that when regressed, will pass all sorts of statistical tests. Below is an old picture from Wikipedia (which, for some reason has recently been removed) that has been used to illustrate data-driven "causality". 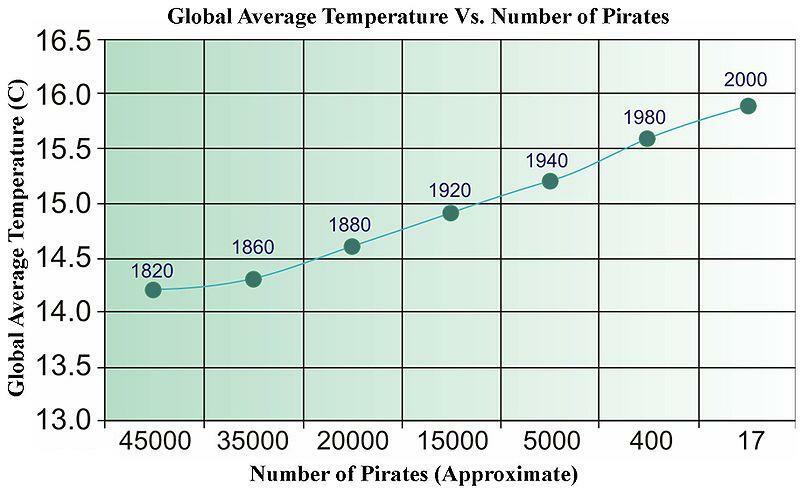 We need more pirates to cool the planet? For time series, there is a term called "Granger Causality" that has a very specific meaning. Other than that, "causality" is in the eye of the beholder. There is nothing explicit in the mathematics of regression that state causal relationships, and hence one need not explicitly interpret the slope (strength and direction) nor the p-values (i.e. the probability a relation as strong as or stronger would have been observed if the relationship were zero in the population) in a causal manner. That being said, I would say regression does have a much stronger connotation that one is estimating an explicit directional relationship than does estimating the correlation between two variables. Assuming by correlation you mean Pearson's r, it typically does not have an explicit causal interpretation as the metric is symmetrical (i.e. you can switch which variable is X and which is Y and you will still have the same measure). Also the colloquialism "Correlation does not imply causation" I would suspect is so well known that stating two variables are correlated the assumption is one is not making a causal statement. Estimated effects in regression analysis are not symetrical though, and so by choosing what variable is on the right hand side versus the left hand side one is making an implicit statement unlike that of the correlation. I suspect one intends to make some causal statement in the vast majority of circumstances in which regression is used (inference vs prediction aside). Even in cases of simply stating correlations I suspect people frequently have some implied goals of causal inference in mind. Given some constraints are met correlation can imply causation! Neither correlation nor regression can indicate causation (as is illustrated by @bill_080's answer) but as @Andy W indicates regression is often based on an explicitly fixed (i.e., independent) variable and an explicit (i.e., random) dependent variable. These designations are not appropriate in correlation analysis. "In regression we intend to describe the dependence of a variable Y on an independent variable X... to lend support to hypotheses regarding the possible causation of changes in Y by changes in X..."
"In correlation, by contrast, we are concerned largely whether two variables are interdependent or covary - that is, vary together. We do not express one as a function of the other." Sokal, R. R. and F. J. Rohlf, 1969. Biometry. Freeman and Co.
From a semantic perspective, an alternative goal is to build evidence for a good predictive model instead of proving causation. A simple procedure for building evidence for the predictive value of a regression model is to divide your data in 2 parts and fit your regression with one part of the data and with the other part of the data test how well it predicts. The notion of Granger causality is interesting. Linear regression implies causality if your covariates are from a controlled experiment, and your experiment isolates the hypothesized causal factor well (see Linear regression and causality in a randomized controlled experiment). Alternatively, (updated thanks to comments), many violations of causality lead to $E(\epsilon|X)\neq 0$. Note that $E(\epsilon|X)\neq 0$ means that we can't draw causal conclusions, but $E(\epsilon|X)=0$ doesn't mean that we can. Note that we can't test whether $E(\epsilon|X)=0$, and there is some circularity in the arguments here. Worse yet is when two variable have a feedback loop. One may cause the other at one point; only for the other to cause the one, later. This always happens in my field, economics: which is why most economic analysis isn't worth the paper it is printed on. Not the answer you're looking for? Browse other questions tagged regression correlation causality or ask your own question. Under what conditions does correlation imply causation? What do “endogeneity” and “exogeneity” mean substantively? Does regression analysis measure cause and effect? Regression: Is it problematic to include a predictor when the outcome variable is based on it? Is correlation required condition for causation? Does correlation correlate with causation? Is Bayes-Ball algorithm enough to argue that correlation can imply causality?